It is very funny all in one free GIF Photo app. 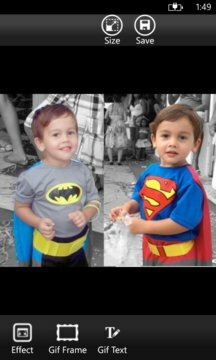 It can add many Animated effects on your photos , Create your Animated GIF with special effects. 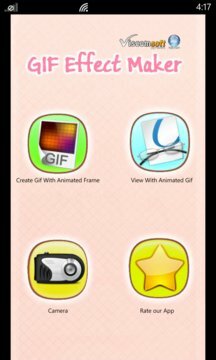 Including animated Effect, animated Text Effect , animated Frame Effect, Camera to GIF Effect, Photo Frame Effect. You can convert one photo to funny animated photo, capture your life to animated photo and post the animated photo to the user gallery of Viscomsoft Social Galleries http://www.viscomsoftonline.com or share them through Facebook and other social media. Capture photos from camera and save to Animated GIF. Add Photo Frame effect on your photo. Support upload your photos to the user gallery of Viscomsoft Social Galleries and share to facebook.